Family is not an important thing, it’s everything! 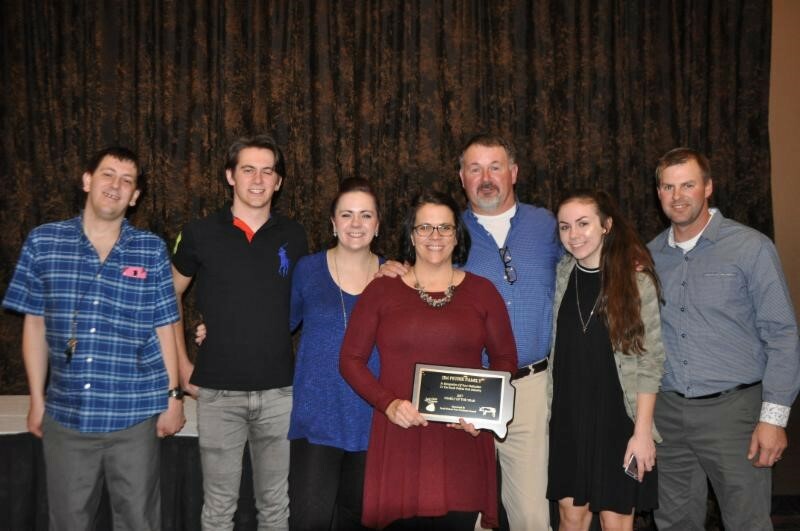 SIOUX FALLS, SD - The South Dakota Pork Producers Council recognized the Jim Petrik Family with the 4th Annual Family of the Year Award during the Master Pork Producers Banquet on Wednesday, January 10, 2018. The award was created to honor a pork-producing family who has contributed to the long-term success of the industry through leadership and pork promotion on the local, state or /and national level. Jim and Sharon Petrik operate a family farm north of Gayville, South Dakota. Pork production has always been a part of the family farm and though the operation has evolved over time, it continues to be a big piece of the pie at Petrik Farms. Along with hogs, cattle and crops. Jim and Sharon have also raised four offspring at the farm- Ryan, Allison, Chase and Olivia. All the kids have been actively involved in the farming operation and especially the hog business. From iron shots to AI to ear notching to loading and delivering, the family has many memories of the fun times and the challenging ones. The kids have all been active swine showman in the 4H area as well, showing animals that they have helped raise from birth. The Petrik’s have been very involved over the years at many levels in Pork organizations. Jim has been on the board of directors of the SDPPC, Pork America and the American Berkshire Assoc. well as other pork related boards and task forces. Sharon and Allison are both great advocates for modern agriculture and technology on social media and the Petrik’s have donated many hogs and BBQ packages for fundraisers all across the Midwest. The pork business has been good to the Petrik’s but Jim says the best part of the industry is the people and the many friendships they have developed over the years. The South Dakota Pork Producers Council (SDPPC) was created in 1954 to responsibly serve, support and enhance the success of the South Dakota pork production industry. Along with managing industry issues and improving the image of the pork industry, the South Dakota Pork Producers Council works to insure a safe, wholesome product for the consumer’s confident consumption. South Dakota’s pork producers have 170,000 sows and they produce 339,000 farrowings per year. South Dakota is ranked #11 in pork production and ranks #2 in pigs per sow. South Dakota ranks 9th nationally in number of pigs born in the state. South Dakota’s pork industry contributes $2.1 billion overall economic impact of SD’s Swine Industry. Also, South Dakota pork industry contributes $17.4 million in total tax revenue.